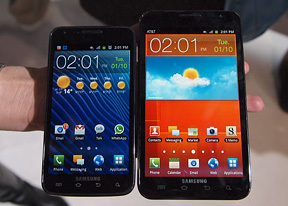 I hope/wish,Samsung Galaxy S3 is 3D Full HD Super amoled PLUS display (960 x 1280pix) resolution and over 350PPI. i dont know why gsm arena didnt talk about it. To be honest I'd say they're almost 'too' focused on the tech side (not that I'm complaining - most phones coming out this year will essentially be the same specs as the GS2) BUT I'd like to have a desirable / funky / quirky handset too! Sammy is all about substance over style - I get that... BUT here's hoping that the GS3 comes along and it doesn't need a facelift! Here's hoping Feb's show brings some eye-catching surprises! If the Galaxy Tab 7.7 can keep the Exynos with its LTE, why can't the other devices!? AnonD-16342, 11 Jan 2012I forgot when was the last time when I looked at a new Samsung Device and said, that looks dif... moreExactly! They all look the same with the same old boring design. Samsung smarttoys are ugly and not easy on the eyes like the Lumia 900, the Android killer. In every details, iPhone is better than these phones. this is so boring, yawn! Is this CES of my memory lane? feels like I have seen it all. Anyway, the other new device is the Samsung Exhilarate. It's made of 80% recycled post-consumer materials, AT&T advertise it as "the first 4G LTE smartphone built to meet many environmental and sustainability standards". It's got a 4" Super AMOLED screen and eco-saving software features. i bet there are a lot of "post-customer materials" put into this phone. what do sony really bring to the table other than last year's hardware? no news about Galaxy S3? Boring, don't like huge devices, Sony is much more interesting. The Galaxy Note is a monster... in size that is and in specs. But it's too big for my liking. I'm happy with a 4" screen on a medium size device. The new Sony Xperia really does it for me.